Who says that vegan dogs can’t enjoy the same kind of treats that other pooches do? No longer is your dog stuck with biscuits and the usual vegan treats – now they can enjoy the tough, “meaty” goodness of these tasty imported vegan dog treats by Animal Farm! Made in Europe with the finest GMO-free ingredients, your dog will be one happy pup when you give them one of these treats. Chews are available in two options: 45g (1.6 oz.) 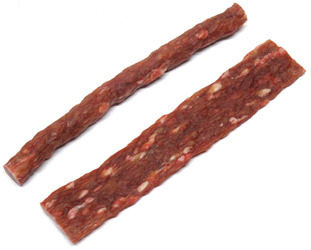 Beef Sticks are $1.29 each, and 30g (1.1 oz) Jerky Strips are $0.99 each. Both treats are approximately 7” long. From Karin Bartimole of New Rochelle, New York on 2/7/2018 . From Deb W of Denver, Colorado on 12/16/2017 . To make the treat last a bit, I break the beef stick in 1/2s for our dog and give her 1/2 at a time. We then tie it on 'fishing pole' - elastic band with stick - and she loves grabbing it as it drags on the ground or bounces in front of her; stick the beef stick into one of those dog toys that look like a soda pop can. Our 2 y.o. border collie-pit bull-you name it mix loves them and chews them fast. She loves them and they are totally worth it! From Andrea Nassar of Ballston Spa, New York on 1/14/2017 . If you have a dog who is a really strong chewer, then these are probably great for him or her. However, if you have a dog who swallows large pieces wtihout chewing well, then these probably aren't that safe. My beagles really love them, though my old guy can't chew them as they are super hard. But, they certainly don't disappear in 5 seconds for the other ones, and they chew and chew on them until they are tired, and then leave the rest for later. Good product overall. From Mary Marshall of West Lafayette, Indiana on 8/20/2014 . My dog is a major chewer, so I was hoping this would be a good replacement for the rawhides he used to get before we became vegan. Unfortunately these are a bit TOO hard, like another reviewer said, almost like plastic. My dog was definitely able to crunch through them, but I worried about his teeth, him choking on pieces, and now we will have to see if he does ok digesting the stick! I won't buy these again, but hopefully something else on this site will work for my pup. From Sarah of Auckland, New Zealand on 7/19/2013 . Our little 10 year-old Pekingese had a little trouble with these at first as they are pretty tough. But she didn't want to give up her tasty treat and can now polish off a half stick/strip in about 10min.